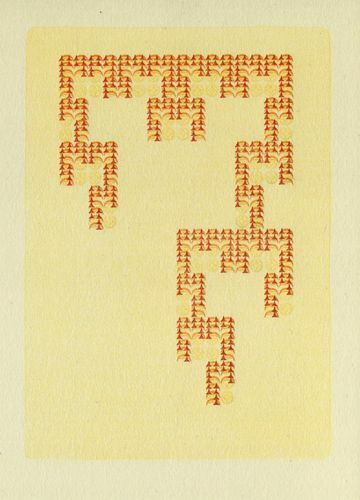 Nothing interests me more than seeing someone do something new and different with fractal art and Velocipede has put her letterpress printing skills to work and printed out some 21st century art with technology that Benjamin Franklin would have been comfortable with. And with style too, as usual. A simple and straightforward fractal-ish image but rendered (by hand) in a whole new way. I’ve always liked the look of printed imagery like this. It’s got a rendering style all it’s own. I like this one even more than the first which has more color in it, but lacks the rich variations in shading and “texture” that this julia shape has. 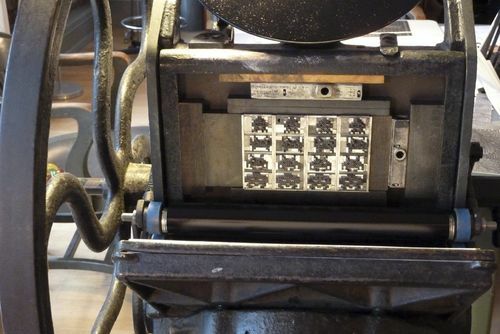 Printing is special kind of paint brush and even though it was originally designed for mass production, or at least with smaller hand presses, for higher volume production, the imagery has a creative touch to it. It’s no wonder that print making hasn’t lost its appeal: nothing can duplicate it, no pun intended. Note the "fractal" printing assemblies in the background. Photo by Mr. Velocipede. As you can see it’s a hands-on art form and not the sort of pushing buttons and turning dials things that computer artists are used to. At the same time there’s a certain charm to these old-style methods and machines that computers have yet to catch up with. Although its much heavier than a computer, I wonder if in fact it might be easier to operate than Ultra Fractal? 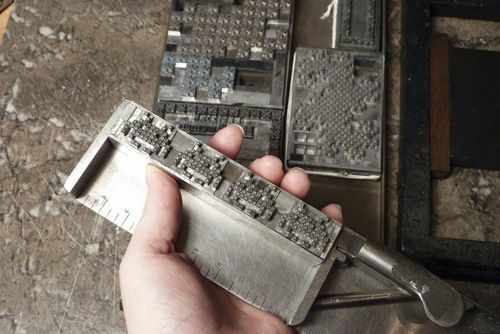 Of course, the artistry is in the assembly of the type and the skill in putting all the media –type, ink, paper– together. And what exactly is she setting up to print? Pretty cool eh? I think Mr. Velocipede is quite enjoying her printing press art form. 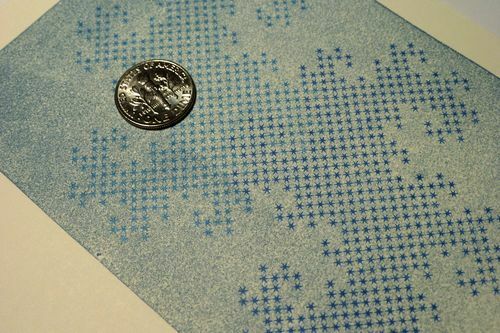 A nice combination of computer “pixel art” and old-fashioned printing methods. And the result is not simply an image file displayed on a monitor but something you can actually touch with your hands. On the other hand you can’t send them by email. I suppose with some careful tinkering one might be able to produce something similar with a bubble-jet or color laser printer and card stock, but I imagine you’d be “hard-pressed” to reproduce the embossed effect of the type, and the tone of the ink. 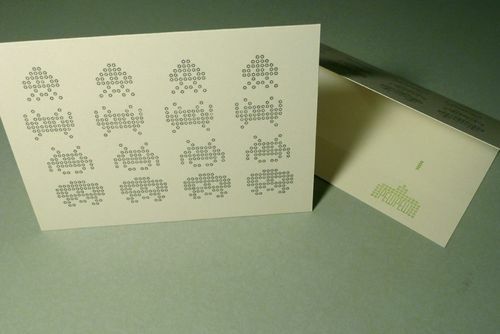 I think they’re quite tasteful and stylish especially considering that the age range of people who grew up with space invaders (mid-forties) are now entering that phase of life where they don’t think twice about paying for something unique and nostalgia-inducing. Perhaps something like this, especially the fractal themes, could have some commercial appeal? 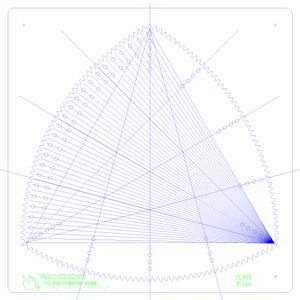 Anyhow, there’s more on Velocipede’s new shiny blog, nice fractals too. She’s got a real sense of humor, too. A Phoenix Double Nova fractal, after the manner of Dan Wills, whose densely complex images I admire very much. Take a look for yourself or even subscribe. I’m sure there’s even better stuff to come in the days ahead. And you won’t find things like this anywhere else. 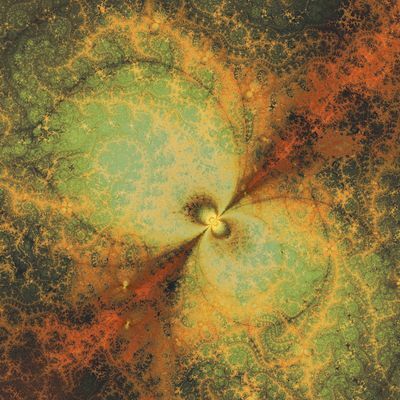 ← Are fractals better categorized as Generative Art?